Fourth time Blood Donation in Canada from New York. Again I am going to donate blood in Canada with a couple of dozen Canadian Nepalese on September 8, 2018. I had chosen Canada as my next destination. I came to know that about 100,000 new donors are needed every year to meet demand in Canada. I have listed contacts of Nepalese people living in Canada through Facebook and Google. I am educating, advocating, encouraging the Nepalese people in Canada to donate blood. 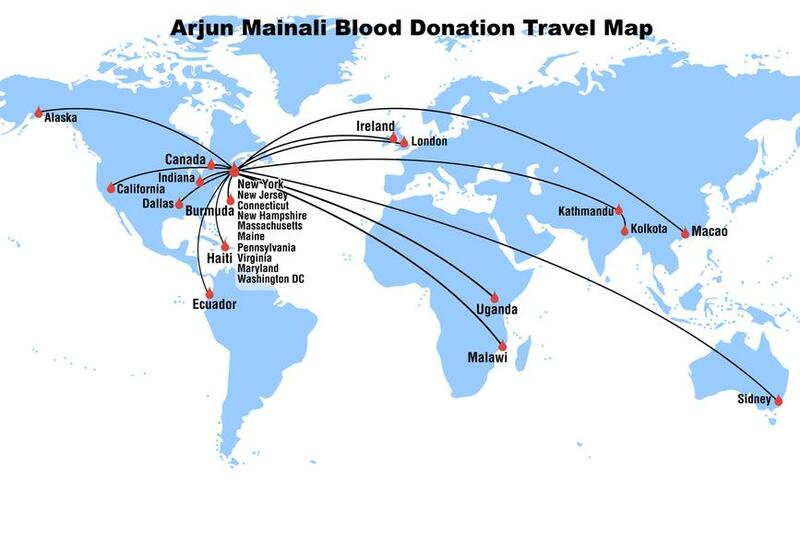 I helped to sponsor blood drives in Mississauga and I landed at Toronto Airport on March 1, 2013. Dr. Govind Singh Rawat was at the airport to welcome me. We went directly to the Blood Donor Clinic, in Mississauga and along with other 15 Nepalese blood donors, I donated blood for the 108th time. Gopi Krishna Kafle, General Secretary of NRN Canada was delighted with my initiation and promised to make it one of the annual programs of his organization. When I could save the lives of patients in different countries it feels like our country the United States is helping them. I have felt the same at every event and every moment. Sometimes I did not have money to pay air tickets to go to Canada to donate blood. In fact, one time I drove all the way from New York. It took 10 hours to reach to Mississauga from Hicksville driving 509 miles on September 27, 2014. 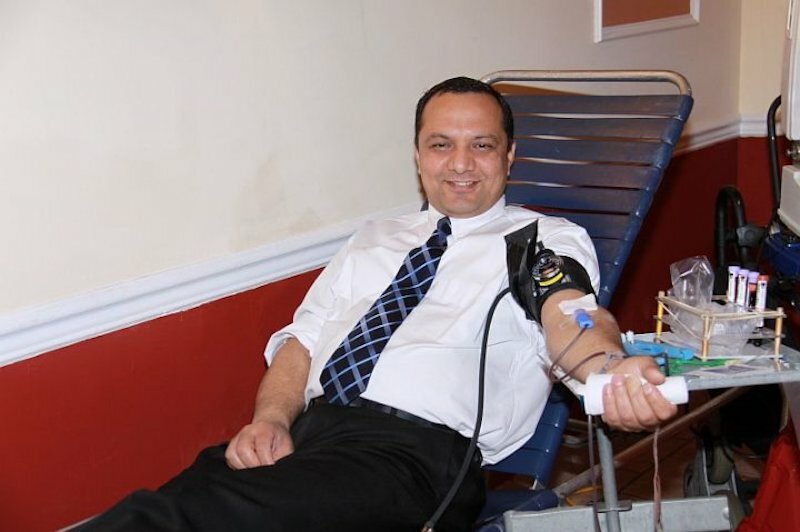 I received a very warm welcome at the Blood Donor Clinic, they were happy seeing me coming from New York to Mississauga just to donate blood. This was also an example for those who aren’t able to drive after blood donation. The fourth time, I went to Toronto, Canada to donate blood on June 20, 2017. I left home at 5:30morning to go to La Guardia Airport to catch my flight at 7:30. After 10 minutes of driving, there were big traffic jams. I thought that I would never enter the airport. I was nervous. My heart was fast pumping. My forehead was sweating. My blood pressure increased sharp spirals running through my body. Construction was working on the airport. Their trucks were hindered by other means of transportation. My car was stuck between taxis and trucks. I parked the car in the no parking space and went to the Air Canada’s counter for a boarding pass. They refused a boarding pass because I was late. My face was darkened and I returned to the door. I remember that the email received a reminder from the airlines last day. I checked the email. Thank God! My boarding pass was there. It had only 38 minutes left for the flight. I ran to security and immigration and stood at the front of the line. An Immigration Officer indicated that I would sit behind and wait. 20 minutes remained for the flight when I have done. There was a long on-boarding line. I took a long breath and bought a liter bottle of water from the nearby the café. I drank it all in 15 minutes. My seat was between two women. One of them was so angry with me because I ran the toilet many times during the flight. Canadian Immigration asked me why I came to Canada. I answered to donate blood. I showed my worldwide blood donation campaigns. My appointment was 11:00 in the Blood Donor Center, in Toronto.A nurse found my pressure was a little high when examining my health. After a couple of minutes, she checked again and was good to donate blood. It was not surprising that the blood of my body was a choice to try to save Canadian Citizen’s life. I returned to New York after completing my blood donation at 4:15 pm. My car was not outside the airport. The security personnel on duty told me that maybe my car was towed. I could not find the car key in my pocket. I was so worried. Finally, I found my car with the key. I had forgotten to take the key in the morning time. I was lucky my car was not stolen. My wife called me why I was delayed that day coming home from work? She didn’t know that I went to Canada just to donate blood. In the morning there was anxiety to leave the airport and afternoon to the delay in reaching the home. I got home at about 6:00 PM. Some guests and friends were waiting to celebrate my birthday. It was an amazing birthday with blood donation. It is not a common task to give blood of your body to other people by spending time-consuming resources. Perhaps it is not possible for anyone to think like this. My only wish is to motivate the Nepalese people to save lives of patients from donating blood wherever they are. I’m trying to drive the Nepalese people for this noble cause and have visited different places to motivate them and I have donated blood with them. This article is only lightly edited.